For the Korean movie fanatics out there, good news!!! There is an upcoming Korean movie that is currently making a big noise both here in South Korea and abroad. 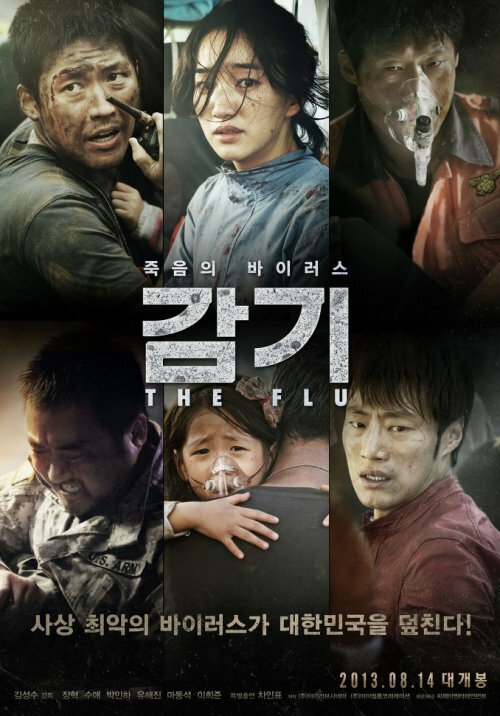 The movie is under the title "감기" and the corresponding English title is "The Flu". The movie is all about the outbreak of the viral disease brought about by the virus called H5N1 or Bird Flu. It has become epidemic that it affects about 2,000 people every hour and everybody infected with the virus will die in 36 hours. The challenge is put into the hands of a firefighter and a doctor struggling their way to find the solution to this epidemic before everyone dies of the disease. The Flu is directed by Kim-Jung Su and top billed by Jang Hyuk and Soo Ae. A Filipino student here in Korea is also lucky enough to be included in the cast, his name is Lester Avan Andrada. He played as an illegal overseas filipino worker in the movie and his role is very important. The disaster film "The Flu" (감기) will hit theaters this August,it will be shown both here in South Korea and in United States. I am excited about the movie not only because of the interesting story but also because of the inclusion of a Filipino actor in the movie. I would like to see how his character affects the whole concept of the movie. At this point, I have some expectations about this movie. Expectations maybe different from the reality but I have high hopes for this film and I have a feeling it will hit the world like a wave. Since the movie's genre falls under the disaster film, I am expecting that this movie could make my adrenaline alive throughout the duration of the movie. As per trailer is concerned, time is very essential, it is all about racing with time, no dull moment at all. Movies like this are best when there are more actions than drama. Of course, we could not take the drama out of the scene, it's a very important part of the movie and to also reach the tearjerker market. But with the life of 2,000 people at stake every hour, I could not afford to watch it with more drama than action. I want to see the story progressing in every single moment of the movie. It could be a traumatic, heavy and scary, but what really makes a good movie is the life's lesson it could impart to the viewers. I don't know where and how to get insights from an epidemic movie, but that's what I am expecting from this movie. This would be an interesting one as we all know how the bird flu virus and other airborne viruses work so to plug in a story there is just a great concept. gonna watch it! i really admire korean movie esp. how they manage to make a wonderful love story who always get on the top in asia! thanks for this info! It's good to know there is one Filipino actor... sad to hear he is playing a stereotyped role - illegal worker. I don't know with you but watching the trailer breaks my heart. Definitely something dramatic + adrenaline rush. I wonder if this will be released with subtitles? I think is a very good movie. And I predict that this could be a tragic one. I am very curious to know how the entire story of this movie and how the flu is being controlled and how many had been affected. Korean movies are really good especially on horror and action. I saw this movie yesterday. I cried so much! Best movie ever! I saw this movie and it was great!!! I saw the movie today. I have recommended the movie to my friends and it went viral.